In June 2015, I spent a month as a guest blogger on PrawfsBlawg.com. That series of posts is reproduced here. Thanks to the PrawfsBlawg for welcoming me as a guest for June 2015! Early summer is a good time to think broadly about how we structure the courses we teach, before the daily and weekly deadlines start to constrain our choices. In that spirit, I will devote this month’s guest posts to the theme of Strange Bedfellows in the Constitutional Law Curriculum: cases that are not ordinarily taught together, but could be. For many courses that rely on the case method, case selection can be a major outlet for a teacher’s creativity. When teaching, say, the intentional tort of battery or the proper operation of Rule 11, one can find good vehicles from literally thousands of cases from dozens of jurisdictions. This is less of an option for US Constitutional Law, which by its nature largely devoted to teaching a single text interpreted through a canon of famous (and infamous) cases. If a Con Law teacher isn’t entirely happy with the facts or reasoning of Brown v. Board of Education as a teaching vehicle, it can’t simply be replaced with another opinion that better matches the teacher’s pedagogical goals. The major creative choice in this course is to decide which relationships to emphasize among a basically fixed set of cases. The usual approach structures the course into a series of doctrinal silos—e.g., begin with judicial review, then move to powers of Congress explored one at a time, then individual rights explored one at a time—with the cases assigned to the best-fitting silo. Among the problems with this approach is that almost all of the important Constitutional Law cases involve more than one silo. US v. Windsor (the DOMA case) is about Congress’s power over marriage and about fundamental rights and about equality and about the proper role of the judiciary and about methods of constitutional interpretation. If we reduce our reliance on the silos, a case like Windsor (and virtually any other really important canonical case) contains many opportunities for comparison among cases that aren’t ordinarily conceptualized together. 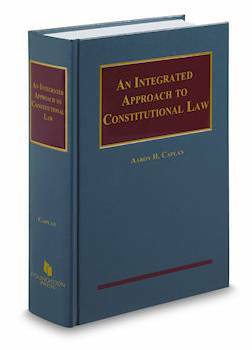 The inspiration for this blogging project came while working on my new casebook, An Integrated Approach to Constitutional Law (out now! don’t delay!). The writing process made me realize that I am by nature a lumper, not a splitter. I hope you will enjoy reading about some differently-structured lumps.